Indian festivities are incomplete without the light of oil lamps. These are prominent part of a traditional home décor. Oil lamps are generally used on the occasion of Diwali (also known as the Festival of Lights), to welcome guests, for every day worship and at inauguration ceremonies. Candles can never replace the authentic oil lamps from India as these are an integral part of Indian culture and are considered to spread a holy aura throughout the home or office. These are handmade brass oil lamps. 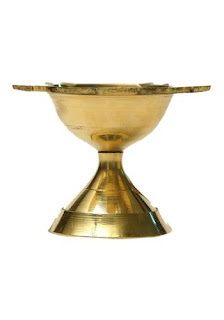 Brass is a golden metal and thus when oil lamps are lit, it is filled with a sacred glow. These handcrafted oil lamps or diyas should be illuminated using ghee or vegetable oil. Indians even use butter to light the lamps during pooja or festivities. The oil lamps are so beautiful that these can be used to decorate living rooms, bedrooms or even dining tables. 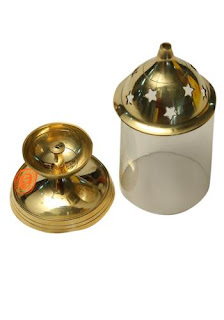 Keep these brass oil lamps clean and shining for a long time period by wiping off the grease with lemon and warm water. These decorative oil lamps are known as Akhand diya. The glass oil lamp is made with transparent glass and sparkles like crystal. These molded glass oil lamps (also called as Deepam Kundu) come with brass cover. Create a calm and meditative atmosphere in your pooja room with Deepam Kundhu with lid. The glass lid keeps the lamp illuminated even in an open space or under the fan for long hours. There are small star shaped holes on the lid which spreads the light even when the oil lamp is covered. Use steel wool, wire mesh, sponge and liquid soap to clean the oil lamp. Decorate the entrance of your home or office with the oil lamps with stand. These oil lamps are intricately designed and sculpted in the shape of peacocks, birds or lotus. The grand look of these oil lamps with stand can be used at the inauguration of ceremonies. These handmade Indian crafts are thoughtful gifts on occasions like anniversaries, thanksgiving, weddings and birthdays. Artisans generally use the age old sand casting technique to make these oil lamps. 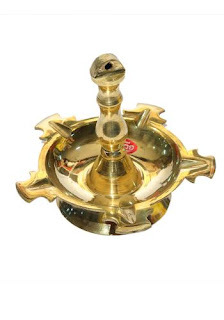 Place this oil lamp stand at the corner of the room to spread equal amount of light at all corners. 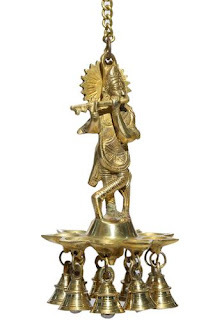 Light up your pooja ghar or temple with the stylish Lord Krishna hanging oil lamp or one step peacock brass pooja diya. Besides exquisite beauty, these oil lamps are also ideal for small pooja rooms as these can be hanged from the ceiling; some oil lamps can be even mounted on walls. Another advantage of using these oil lamps is that these come with multiple spaces to light more than one diya at a time. Choose a hanging oil lamp which comes with a sturdy brass chain. Clean the wicks and grease after every use else the oil lamps may lose the shine. Give a classical look to your home with antique oil lamps. 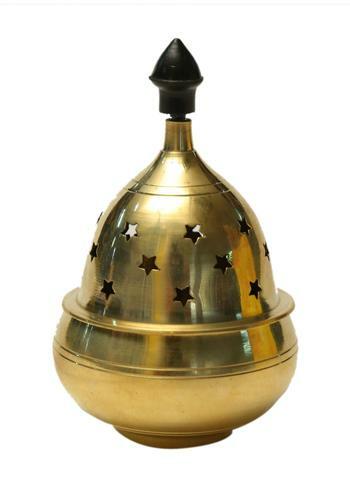 These gold plated diya or oil lamp can be mounted on walls and contains a single space to light. These lamps are finely carved and light weight. These diyas can be easily transferred from one place to another and are perfect gift items on weddings, anniversaries, housewarming parties, new ventures and award ceremonies. Clean these gold plated oil lamps with a mild detergent and luke warm water. Last but not the least; the oil lamps are available in various shapes and sizes. Do not buy one but go for a collection of different types of diya to bring a variety to everyday prayers.